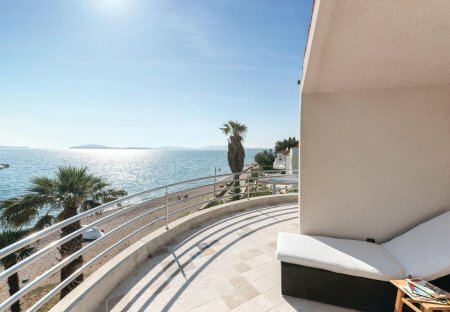 Rent villas and apartments in Žaborić, Croatia with private pools. Book affordable holiday rentals that are near a beach. This lovingly furnished holiday house is located in Žaborić, a small village near Šibenik. The interiors spread over two floors. Spend your holiday in this modernly furnished holiday house which has a very special ambience. In addition to the tasteful decor, you will find beautiful wood, carved to perfection. 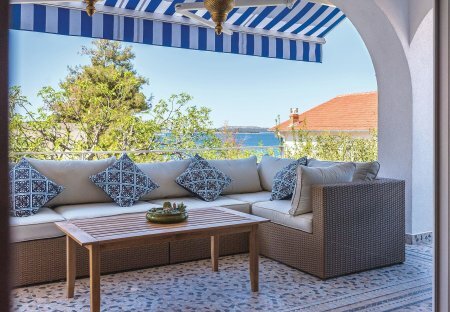 This functionally decorated holiday home with a sea view is situated only a ten minutes drive away from the city of Sibenik. It is an ideal destination for relaxation with friends or family. These simple and functionally furnished holiday homes are located in Zaboric, a small town near Sibenik, with beautiful beaches and crystal clear sea. Since the owner does not live in the house. This charming holiday home is ideal for a holiday with family or with friends. It consists of two residential units that are connected by external stairs. The decor is simple and functional. In the small resort Žaborić is located this comfortable holiday apartment. This 5-bedroom villa for up to 14 guests is located in Žaborić/Zaboric and has a private swimming pool. This holiday apartment is located on the first floor of a family house in the small village Žaborić. This modern and tastefully decorated attic apartment with two bedrooms lies in village Jasenovo, between Sibenik and Primosten. These simple and practically furnished holiday apartments are nestled in the small and serene tourist place Zaboric, close to the historic city of Sibenik and a number of child-friendly beaches. Villa TOSCANA is located in the elite and quite area of the Zaboric, only few meters from the clear sea, It has 8 beds fixed and six additional. ideal for a group of friends or family with children.